MOAPA, Nev. (AP) -- Beyond the ancestral hunting fields and the rows of small, sparse homes, the cemetery at the Moapa River Indian Reservation sprawls across a barren hill with the tombstones of tribal members who died young. Their deaths haunt this small desert community outside Las Vegas. Children play indoors, afraid they might be next. Hoping to keep out the air they believe is killing their people, tribal elders keep their windows shut and avoid growing food on the land where their ancestors once found sustenance. The Moapa Paiutes need not travel far to stare down their perceived enemy: The coal-powered plant blamed for polluting the southern Nevada reservation's air and water is visible from nearly every home. "Everybody is sick," said Vicki Simmons, whose brother worked at the Reid Gardner Generating Station for 10 years before dying at age 31 with heart problems. Across the country, a disproportionate number of power plants operate near or on tribal lands. NV Energy maintains its plant near the Moapa Paiute reservation is safe and has been upgraded with the newest clean emissions technologies. Meanwhile, local, state and federal health agencies say they cannot conduct accurate health studies to verify the tribe's complaints because the sample size would be too small. In all, about 11 percent of all power plants operate within 20 miles of reservation land, according to an Associated Press analysis of data from the U.S. Environmental Protection Agency. Many of those 51 energy production centers are more than a half-century old and affect roughly 48 tribes living on 50 reservations. Fewer than 2 percent of all people in the United States identify as Native American, and only a small portion live on tribal land. In many cases, Native American leaders have long embraced energy development as an economic opportunity for communities battling widespread unemployment. But a growing backlash has some tribal leaders questioning whether the health and environmental risks associated with energy production has put their people in harm's way. While it's not conclusive that coal operations pose a direct danger to reservation residents, the Moapa Paiutes are one of several tribes demanding the closure of their neighborhood power plants. Sherry Smith, a history professor who co-edited the book "Indians and Energy: Exploitation and Opportunity in the American Southwest," said hardly anyone paid attention or were aware of potential environmental consequences when the power plants were built decades ago. "These are not simply people who have been duped by the government or the energy corporations," said Smith, director of the William P. Clements Center for Southwest Studies at Southern Methodist University in Texas. "They are simply 21st century people who are coping with the same issues the rest of us are about economic development and the environmental consequences and having to weigh these things." Among the nation's 564 diverse tribal entities, energy production is widely debated. Many support environmental protections as a natural extension of American Indian values. But tribal leaders also aspire to protect their culture by keeping members on the reservation. Jobs and economic opportunity are necessary, energy production proponents say, and power plants fill the gap. On one end of the spectrum is the Navajo Nation, the country's largest reservation, with five power plants near or on its sprawling territory in the Southwest. The tribe has embraced coal production as a central component of its economy, and Navajo officials traveled to Washington in June to oppose proposed EPA regulations to make the plants more environmentally sound. The new requirements would kill jobs, tribal leaders said. On the other side of the debate have been members of tribes like the Moapa Paiutes and the Northern Cheyenne of Montana, which for years blamed local energy companies for the health woes plaguing residents on their reservations. 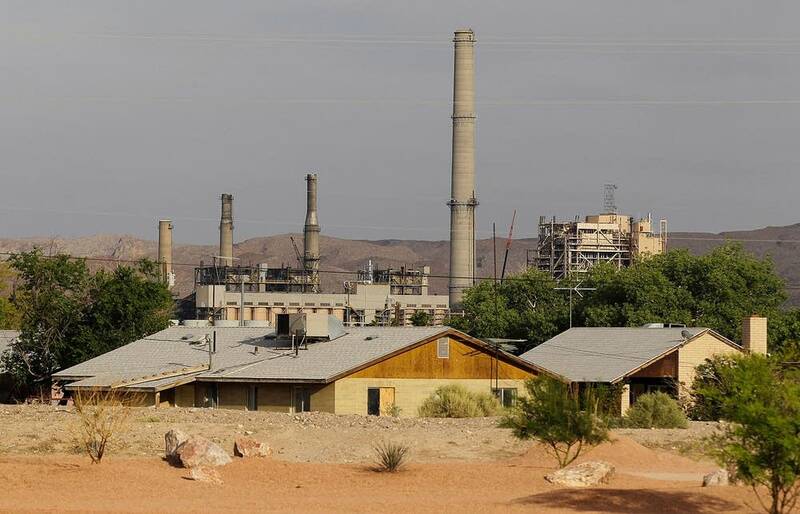 In Moapa, Yvette Chevalier said she became ill within weeks of moving last year to the reservation, which sits 2 miles from the decades-old coal plant that sometimes infuses nearby skies with gray fumes. Gary Lee said he recently lost 40 pounds because of health troubles. Former Tribal Chairman Vernon Lee said it's not unusual for members to be hospitalized. "There have been a lot of heart attacks," Lee said. "Many young people died." When coal is burned, carbon dioxide, sulfur dioxide, nitrogen oxides and mercury compounds are released into the air, according to the EPA. Research has shown those fine particles can be linked to serious health problems, including premature death. Children, who breathe more often, and senior citizens, who tend to have health problems agitated by pollution, are particularly vulnerable, said Colleen McKaughan, an associate director in the EPA's air division. In Montana, the Northern Cheyenne live near the state's largest coal-power plant, the Colstrip Steam Plant. The four-unit power plant operated by PPL Montana produces 2,200 megawatts of electricity and is one of the largest employers in eastern Montana with roughly 400 workers. Many in the tribe want it shut down. In northeastern Utah, the Ute Indian Tribe has threatened to sue Deseret Power over pollution from its 30-year-old plant on the reservation, which generates 500-megawatts of electricity. Ozone readings in the region can reach nearly twice the limit considered safe by the EPA, especially during winter months. "They are legitimately concerned about the impact the power plant has on the reservation," said Michael Harris, a lawyer representing the tribe. Harris said some tribal members have complained of asthma attacks and cancer clusters and the plant might be to blame. Deseret Power did not respond to a request for comment. To be sure, tribes fighting energy companies are the exceptions. The massive Four Corners Steam Plant sits on Navajo land in Fruitland, N.M., where the Arizona Public Service Co. says it generates 2,040 megawatts of electricity and serves New Mexico, Arizona, California and Texas. Tribal members who work at the power plants earn roughly triple the average Navajo family income of about $20,000 per year. The tribe expects to receive more than $7 million annually from the two power plants on its land under its latest lease proposals. "A lot of our own people who are critical of coal are not understanding the economic benefits," said Stephen Etsitty, executive director of the Navajo Nation Environmental Protection Agency. "It's easy to perceive a problem when you see a big power plant smoke stack ... but that often causes you not to look at other areas of concern." In Moapa, Simmons -- whose 31-year-old brother died after working at Reid Gardner Generating Station -- can see the Nevada power plant from her kitchen window. It reminds her of her brother's death. She also frets for her 24-year-old son, who works at the plant and comes home with ash-covered skin. His wife is pregnant with Simmons' first grandchild. "The land is poisoned," she said. "I don't even open my window because I don't like to look at it."